Sony Unveils New MDR-RF4000K Wireless Headphones | OhGizmo! Yesterday Sony announced a couple of new cordless headphones for privately enjoying your home theater setup, and the MDR-RF4000K, pictured above, is definitely the more interesting of the two. 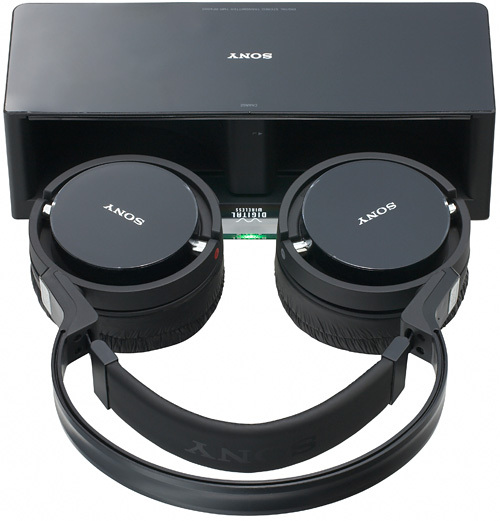 The headphones use a secure digital RF signal which provides a decent range of up to 30 meters or around 100 feet, and their foldable design allows them to sit inside a slim storage case which also doubles as a charging cradle. Sony’s headphone design team has never had a problem with styling, so the MDR-RF4000Ks look great as usual, and the 40mm long-stroke diaphragm ensures they should sound great to the consumer-level audience they’re targeted towards. A built-in NiMH battery is good for about 7 hours of continuous use on a single charge, but if they die in the middle of a flick you can switch to using a single AAA battery which is good for another 10 hours of listening pleasure. Not pictured is the MDR-RF810RK headphones which Sony also announced yesterday. They’ll probably end up being the more affordable of the 2 (official pricing wasn’t released) since they use an analog RF signal instead of digital, but that also means you get a range of 100 meters or around 330 feet instead. They also feature a NiMH battery which actually provides 13 hours of use per charge, or about 28 hours when using a single AAA battery. Both headphones are expected to be available starting in April of this year. Is it suppose to look like a smiley face? up to 30 meters or around 100 feet wow, that's nice, you can just walk around the entire house listening to music, like you couldn't with an iPod. hi friend i read your comment and i thing your idea is great! Is it suppose to look like a smiley face? i think your idea is great! That’s absolutely fantastic! Wow! looks like a smiley.Great device.thanks. nice headphone.i like it to see again.thanks for the post. it's a great device . Nice headphones. I like this. In fact this kind of headphones fascinate me.